Pursuit of Poppy: We've got color! So I finally started painting on Saturday and when I showed Marc the first completed wall, he said, "Oh wow, you went with fluorescent blue." 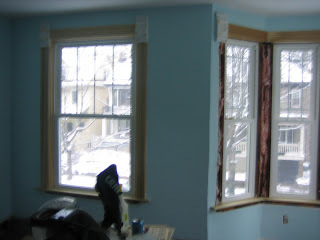 Um no, it's robin's egg blue, but a shade lighter. And luckily it dried lighter then it went on. I was really nervous about this color, I wanted something unexpected and funky, but not too crazy. I think it'll come together when we put the furniture in there. I hope so. Our entire upstairs is getting carpeted next week, so we've been slowly filling our downstairs with furniture and stuff that belongs upstairs. 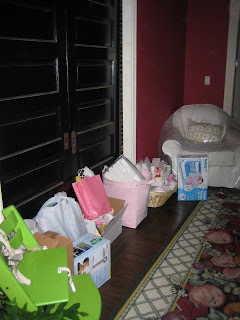 Like our dining room is filled with nursery stuff. Super fun. Today's quilt square's are from our friends that are adopting from Korea, Christa and Andy. And along with their fabric, they attached a heart pendant with Poppy's name on it. Love it! And this one is from Christa's mom, and it didn't show up that great when I scanned it, but the fabric is winnie the pooh. The nursery color looks great! What a beautiful color. I can't wait to see the finished room. It looks like it will be ready for Poppy very soon. How are the referrals moving? I'm loving it. I can't wait to see it all finsihed. I LOVE THE COLOR!! Blue is my favorite and I really think that it is going to look beautiful and soft with all the baby stuff in it! I AM GETTING SOOOOOO EXCITED!! 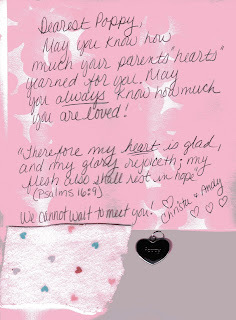 the color is beautiful and I love the pendant and scripture verse from Christ and Andy. Poppy has a lot of love coming her way. The white dream rocker is going to look awesome against that color! I'll take some pictures of ours to share. Our rocker is the green chenille...but it is lighter than I thought it would be.